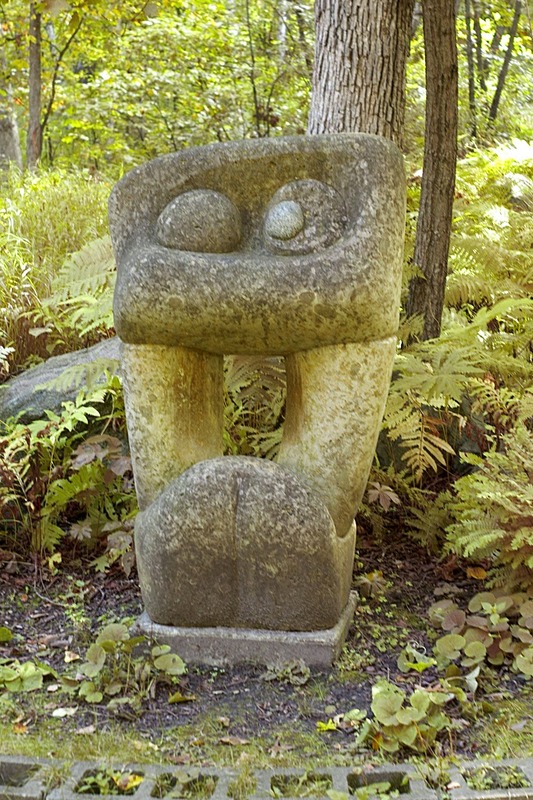 A couple of weeks ago I discovered a gem within the metropolitan area of Minneapolis and Saint Paul, the Caponi Art Park. 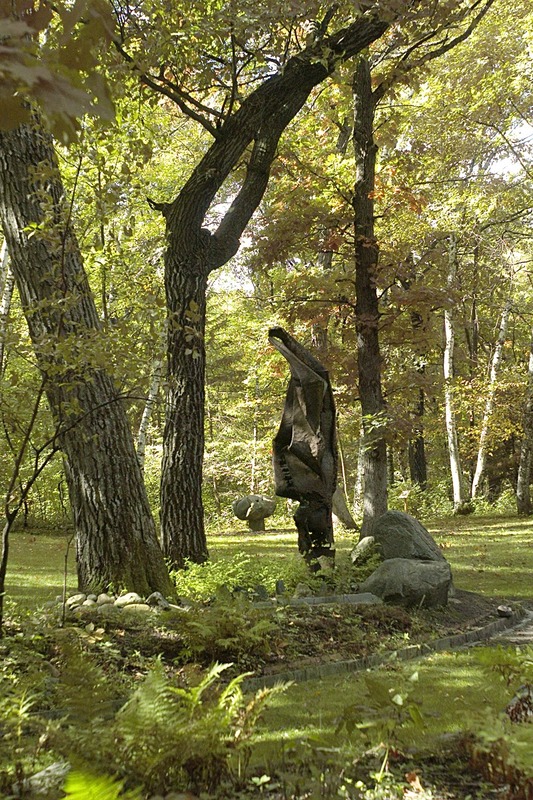 It is located in the suburb of Eagan and is open daily from May through October. 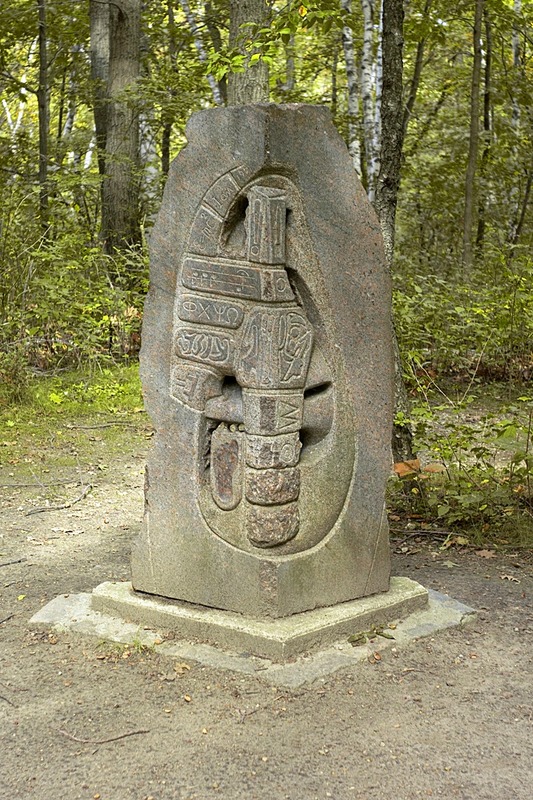 In the 1950, the art park’s founder Anthony Capony, a professor of the arts at Macalester College, envisioned a public space where people could escape the stress of a fast-paced world and experience their connection with art and life in a natural setting. 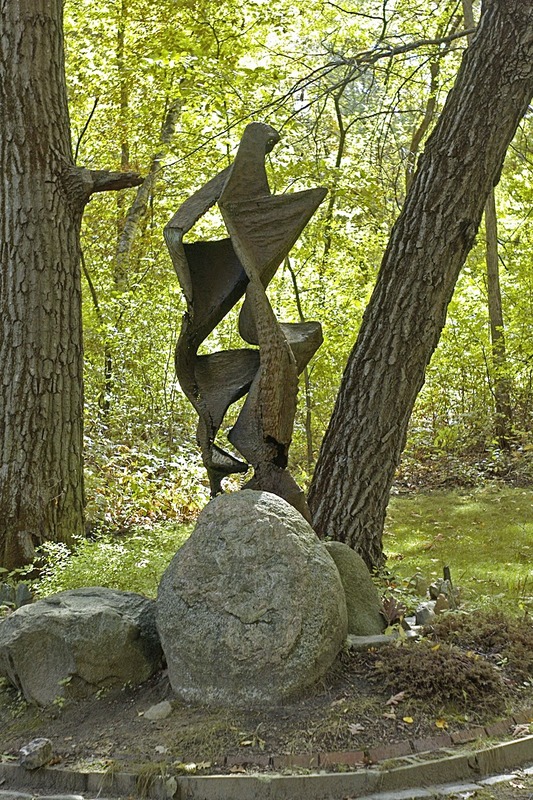 Cornerstone presents the duality of humankind - the intellectual progression from cuneiform letters to musical notes in Beethoven's 5th symphony to the mathematics od Einstein's equationon one side, to the organic natural forms that still resonate with our caveman nature on the other. 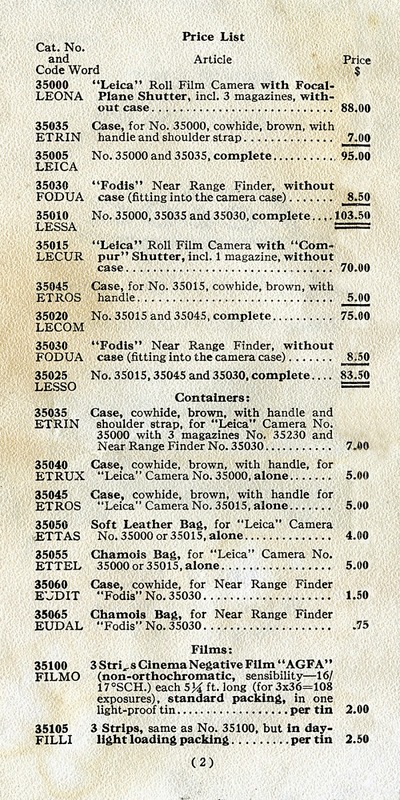 Recently I was able to add an old Leica pricelist from 1928 to my collection and it struck me as interesting that a whole Leica, Model A at that, used to sell for just $88.00. Of course in today’s dollars, the price would be substantially higher. 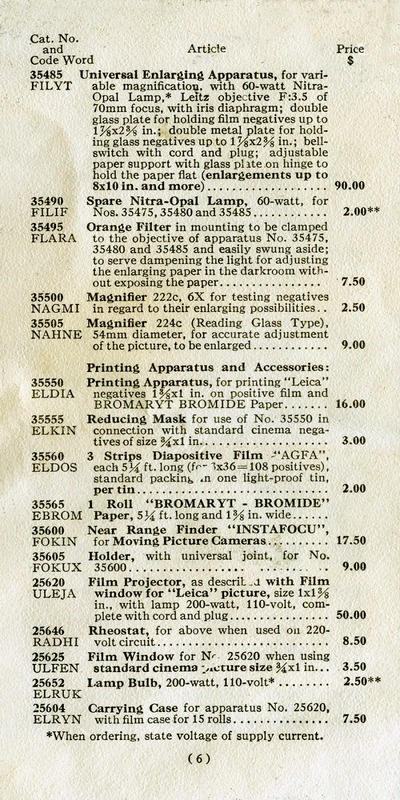 Unfortunately, the pricelist has suffered quite a bit over the years. I have reproduced it here in its current condition, including the yellowed and in some places stained appearance. 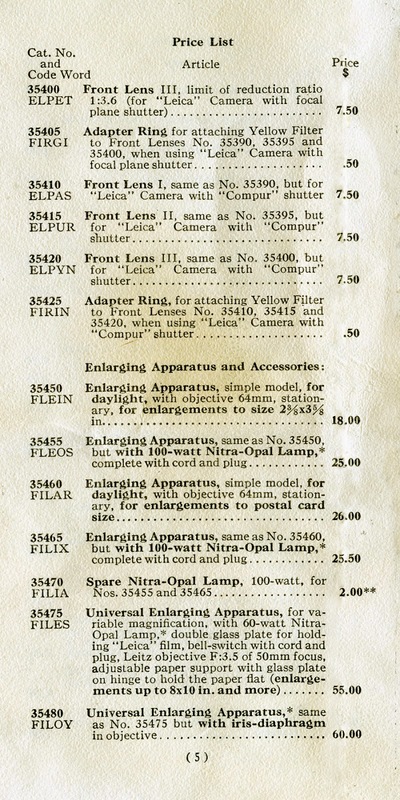 An interesting item to note is that the script of the Leica logo, as we know it today, was not used in those days and obviously, E. Leitz, Inc. as Leica was called then, has moved a few times since. 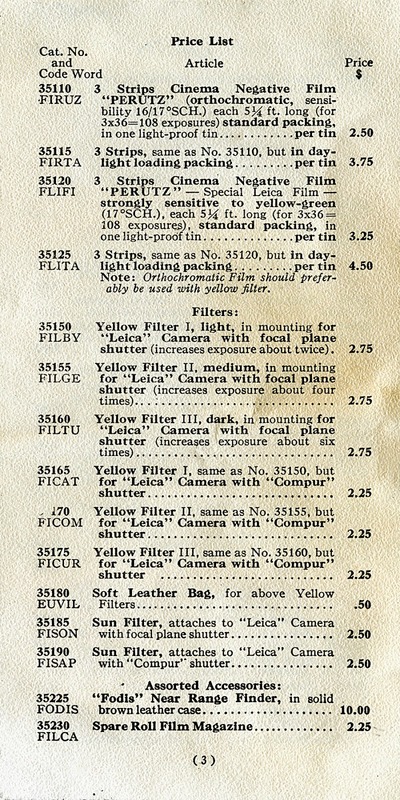 Another interesting fact is that Leitz did not distribute their equipment nationwide. Instead the brochure states that the company of Spindler & Sauppe was the agent for the western states with offices in San Francisco and Los Angeles. 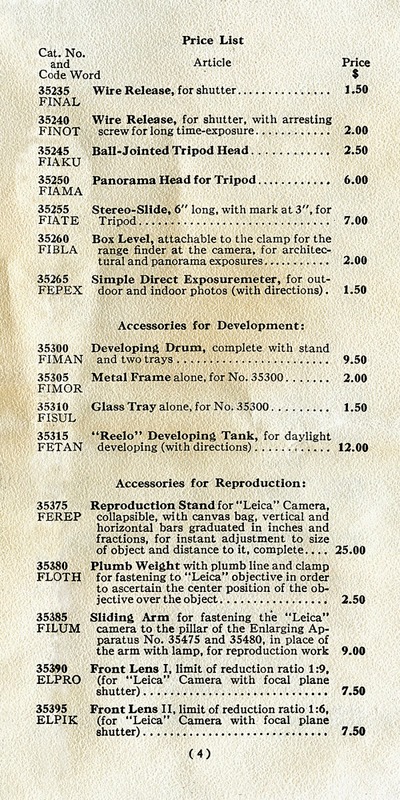 Apparently the common description of 35mm film was not in use at that time either, instead the camera is referred to as a pocket roll film camera using standard cinema film. Reports about the state of the photographic industry all indicate that there has been a definite slow down. Just about everybody reported lower sales volumes. This was further underlined by the fact that especially the market leaders Canon and Nikon had nothing really new to show at the recent Photokina. The notable exception is Leica. Not only did they show a wealth of new items, both cameras and lenses, as well as accessories, but they also were able to point to a very healthy grows in sales. 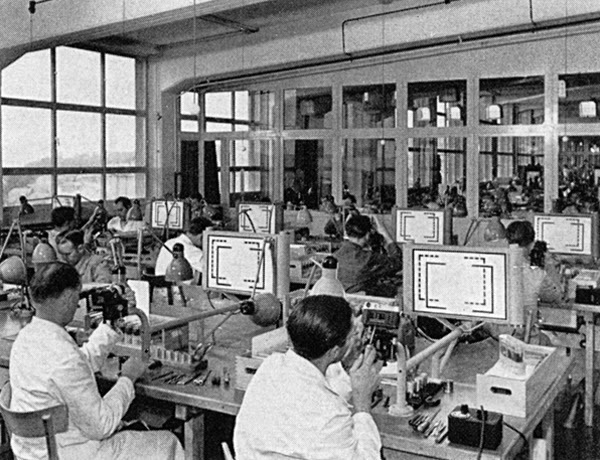 These production methods are thoroughly rooted in their past, starting with the original Optical Institute in Wetzlar out of which Leica evolved. 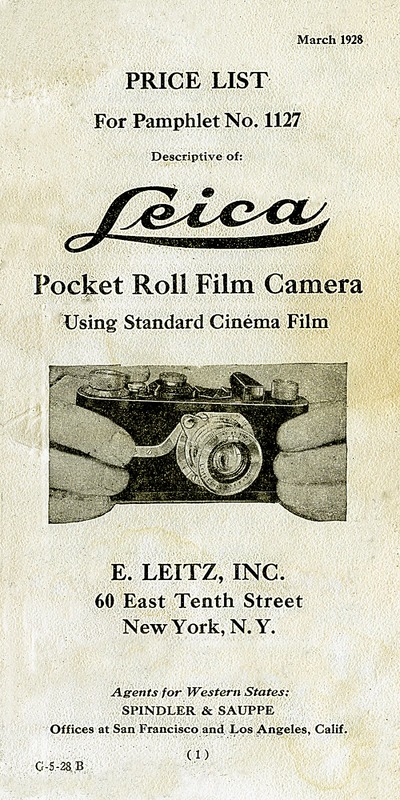 For that reason I decided to republish an article from 1969, when Leica Camera AG was still called Ernst Leitz GmbH, Wetzlar. 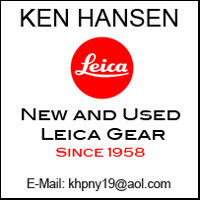 It goes into much detail about how Leicas, Leica lenses, and other Leica equipment are being made. Obviously, virtually all of the machinery and testing instruments have been replaced by modern counterparts, but it is a great account of what needs to be done to be on top of the quality curve in this industry. 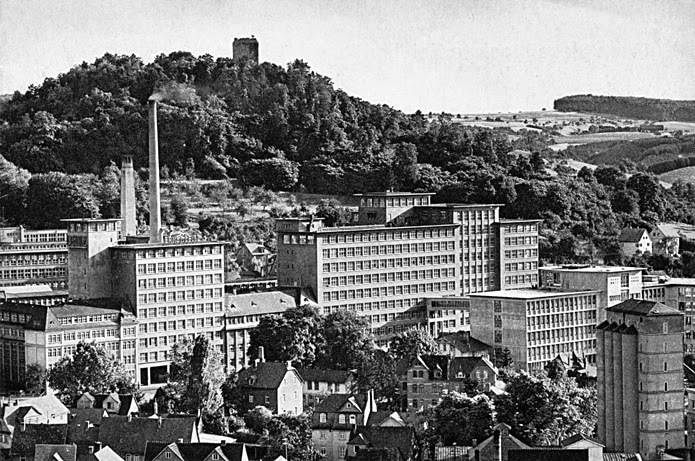 The main factory of Ernst Leitz, GmbH, at Wetzlar with the Kalsmut ruins in the background. For many of the thousands of visitors who come every year to Wetzlar, the name of this ancient free imperial city is bound up with the conception of Leitz and the Leica – symbol of precision optical equipment. 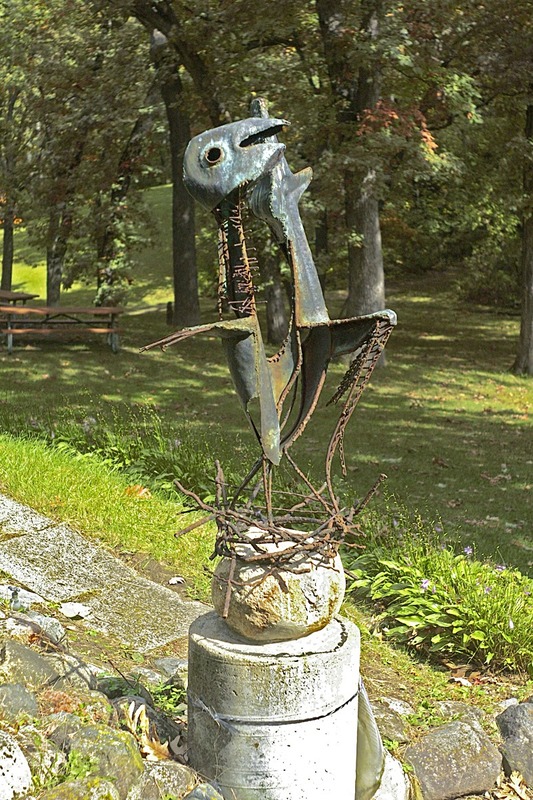 It is therefore not surprising that the Leitz factory exerts greater attraction than the slate-covered old town buildings around the venerable cathedral or the Goethe memorials. We recently had the opportunity of taking part in a visit to the factory. This may comprise a brief half hour’s visit to two or three representative sections, but it may stretch over days where in special cases – e.g. for a news report – detailed information has to be collected. The wide production program, the extensive factory with its many departments, offer such an abundance of material that it is difficult for a reporter, as indeed for the guide in a conducted tour, to stick to essentials. 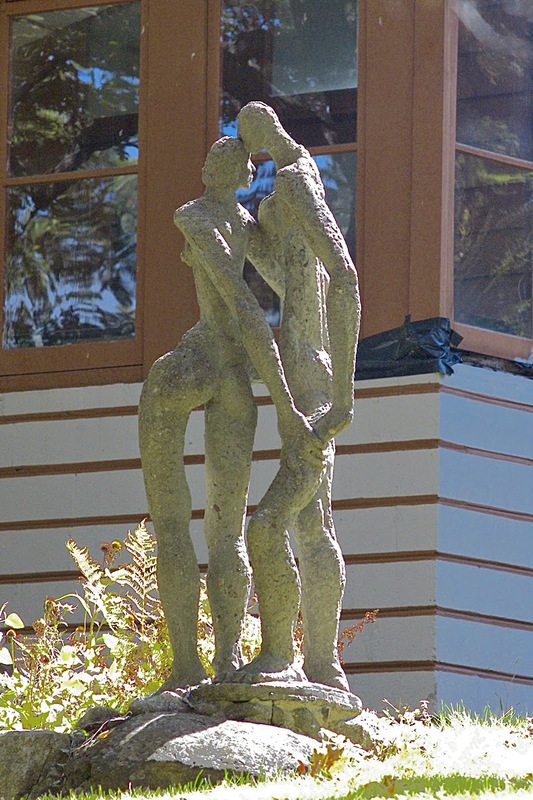 The visitor and – likewise the reader – will have each his own particular interests. 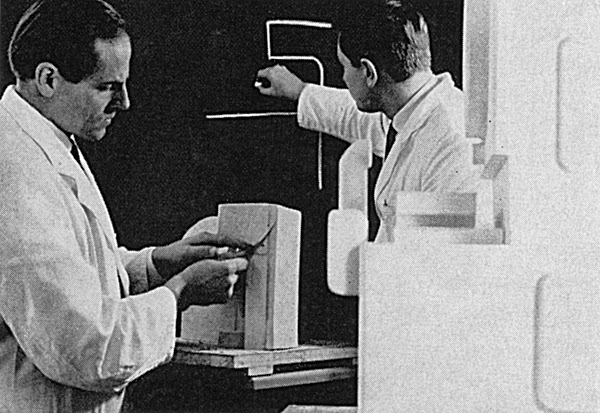 All, however, must commence their tour at the same spot, the progress “from glass block to Leitz objective”; for glass is the essential element of all Leitz products. 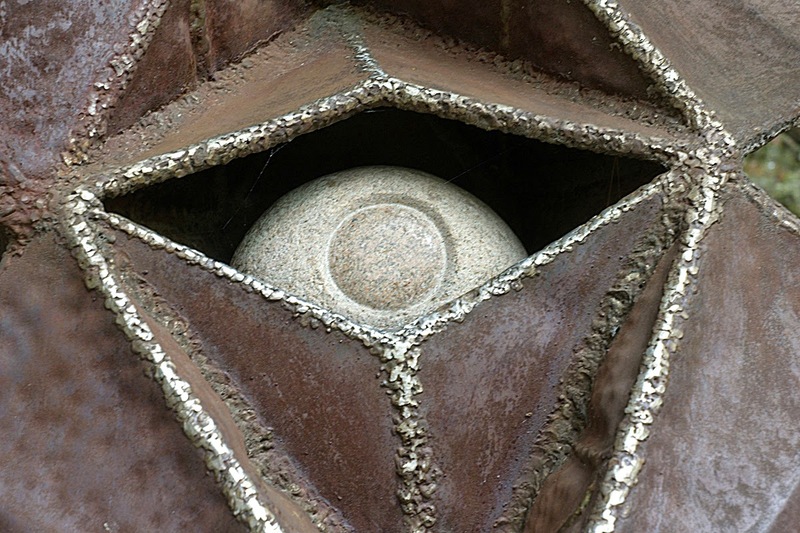 Whether as a prism, mirror or lens, high quality glass is worked into a high grade optical system in the form of an objective, a prism combination for a rangefinder or an illuminating system. In combination with delicately fashioned mechanical components it constitutes a the very heart of the opto-mechanical precision instrument. We begin our round at the glass store. This contains more than 200 different types of glass, all needed in current manufacture. From them are made, as components in manufacture, about 5000 different types of lenses and prisms. Well over 1000 types of lenses and special instruments go to make up the manufacturing program. The glass is stored in form of large square or rectangular blocks. 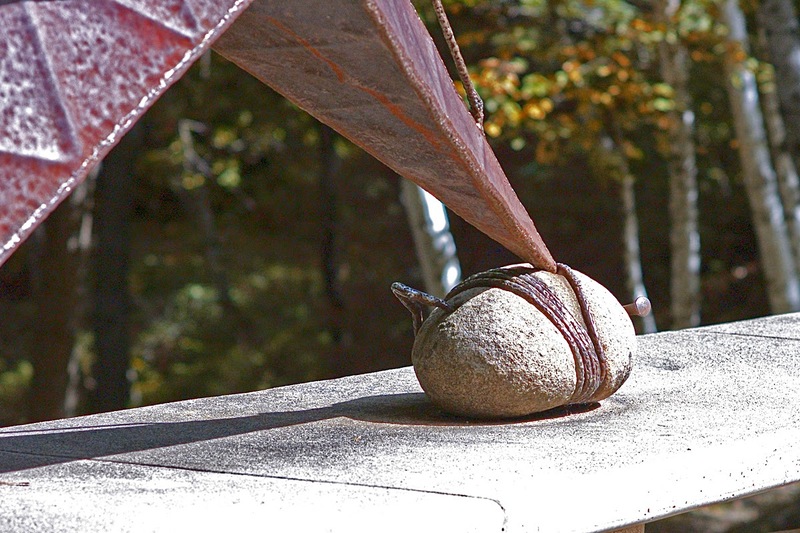 Picking up two such blocks of about the same size, one may be struck by a very great difference in weight. We are told that the heaviest glasses are also the most expensive, and that the various types differ widely among themselves both in their characteristics and in their stability to outside influences. 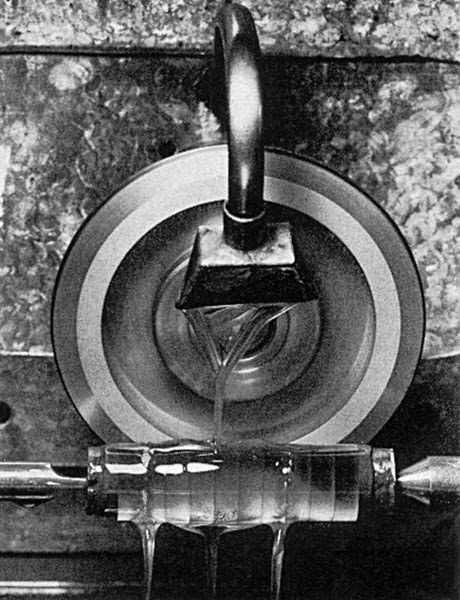 The glassworks also supply optical glasses in the form of rods from about 5 to 25mm diameter and also as molded blanks (for large scale series production) already shaped to the form of the finished lens of prism. From the glass store we proceed first to where the glass blocks are cut up. Diamond saws slit the blocks into plates of the required thickness. The plates are then ground plane parallel with abrasive powder and cut up. The individual cut-up plates are cemented together in a stack and edged circular on special grinding machines. Bat moldings simplify this first working process, because they can be slit right away to the blank thickness. In the next process the circular discs are shaped in the milling machine to the rough shape of the lens. The molded blank is already supplied in this form, and so eliminates the slitting, cutting-up, and edging process. Unfortunately for high grade lenses and for small series, or for very small lenses, molded blanks cannot be used. 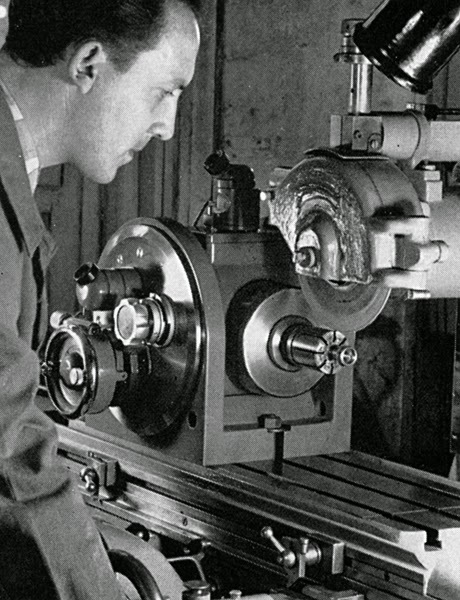 The next stage in the manufacture of lenses is machining to radius and thickness, and in the case of prisms, facing and machining to angle and dimensions. showing some of the glass blocks. is cutting it into plates of the requires thickness. stack end edged on a corundum wheel edging machine. Grinding glass plates plane parallel. 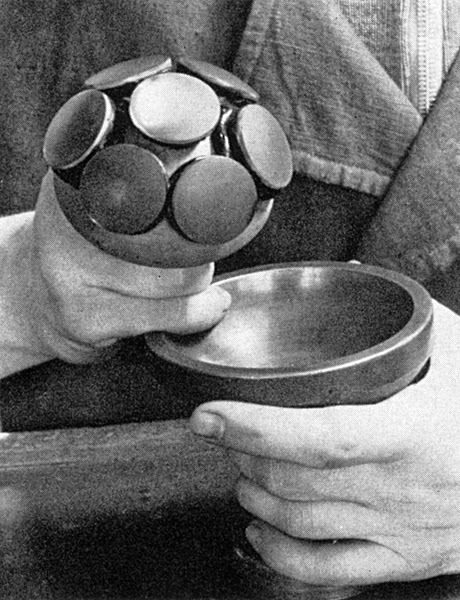 A block of lenses is removed from the polishing tool. The first stage in surfacing lenses is to cement them on a blocking tool with adhesive foil or sealing wax. They then go through a succession of stages of smoothing, using special moistened abrasives. Depending upon the radius of curvature and the size of the lens a great variety of tools may be employed. In the case of the very smallest lenses, as for instance the front lens of an oil immersion objective, the most skilled hand work is called for. 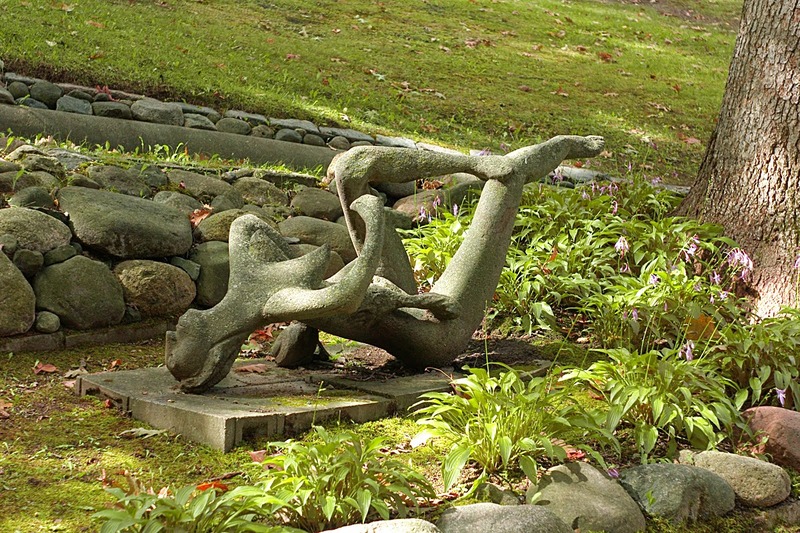 Years of experience and an innate delicacy of touch are prerequisite for this highly specialized work. 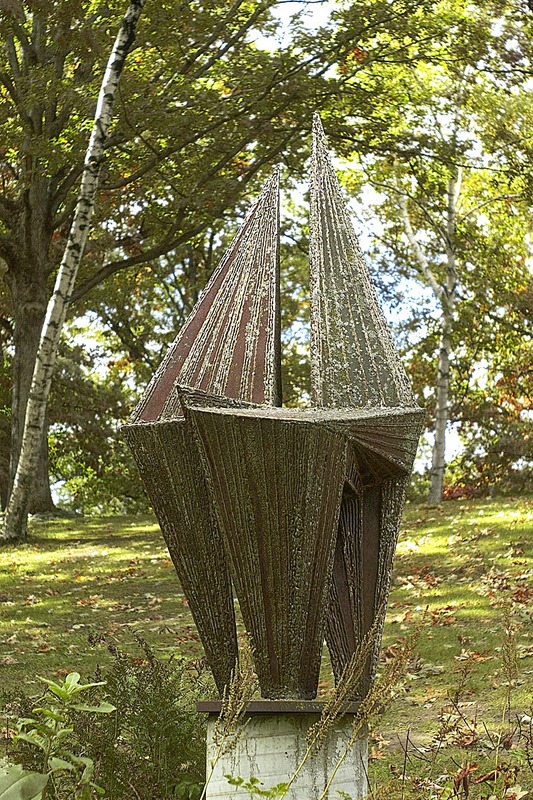 This is equally true of the final stage in the production of prisms of the highest precision. The term highest precision here means that its assessment is beyond the scope of any mechanical method of measurement, and can be achieved only with the aid of optical phenomena (e.g. interference). What is meant by highest precision? 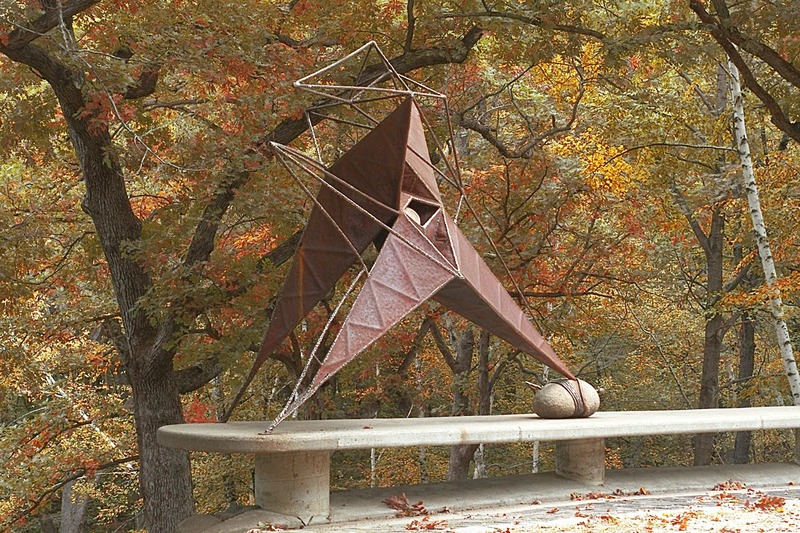 To take an example, the polygonal prisms required for technical measurement purposes must be accurate to one second of arc. This means that the surface must be flat to within limits corresponding to a radius if curvature of 30,000 meters (98500 feet). To give this more practical significance, imagine a traffic policeman in Paris standing with outstretched arms at the Place de la Concorde, and lines drawn from his fingertips to London, meeting on the face of Big Ben. The angle formed by these two lines, 400 km (249 miles) long with a base of 2 meters (6.7 feet) will be one second of arc. Infrared spectrographs incorporate dispersion prisms with a base of 150 to 170 mm. 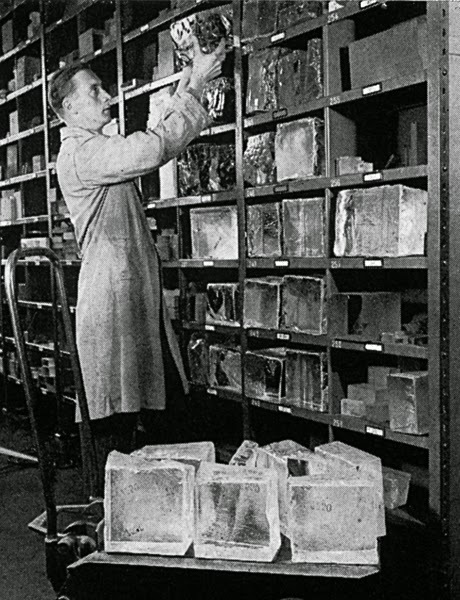 The requisite crystals are grown in the Leitz crystal laboratory. Crystals od such dimensions and the necessary purity are rarely if ever found in nature. Among other artificial crystals are sodium chloride, potassium bromide, and caesium bromide. 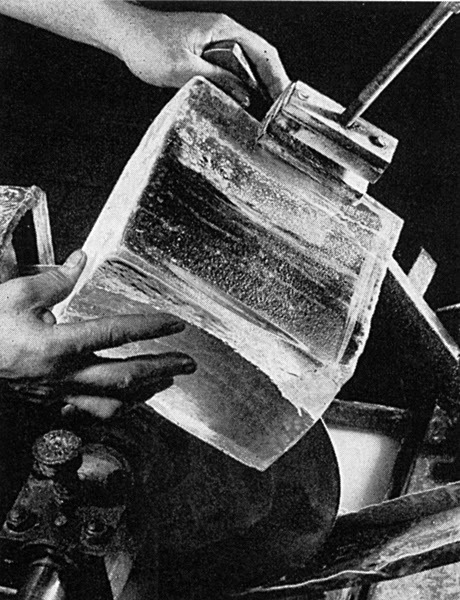 The optical working of such crystals makes the utmost demands on technical and manual skill, because by reason of the hygroscopic properties of the crystals and careless handling, for instance, would leave behind blemishes which could be removed only by long and tedious work. It is therefore understandable that entry into the specially air conditioned and dust protected room cannot, regrettably, be permitted. In the manufacture of large series, a high degree of automation and rationalization is achieved by the use of multi-spindle grinding and polishing machines. A high pitched monotonous whistling and squeaking sound assails our ears, while our eyes are hypnotized by the unceasing rhythmic motion of the tools. 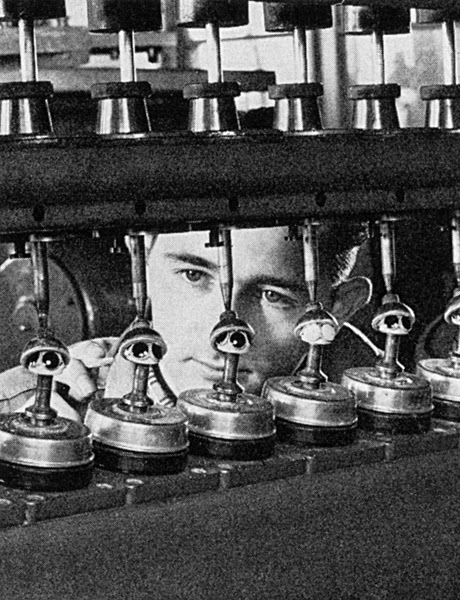 The ever watchful eyes of operators are fixed on their machines. 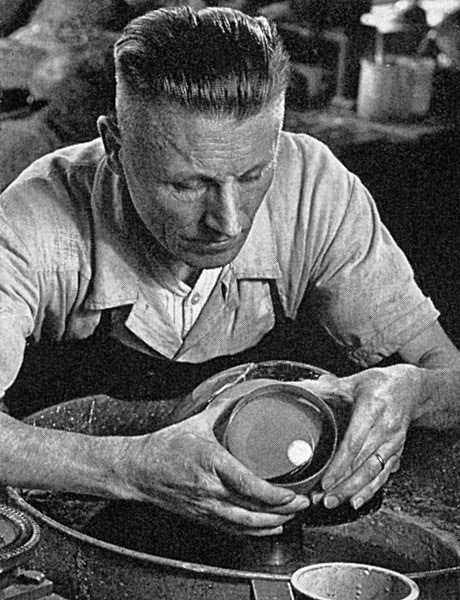 When the grinding and polishing operation is nearing its end, the block of lenses is removed. Careful, almost lovingly, the experienced hand of the expert operator strokes the surface of the lenses as with critical eye he judges how far the process has progressed. formed indicate any deviation from the correct curvature. 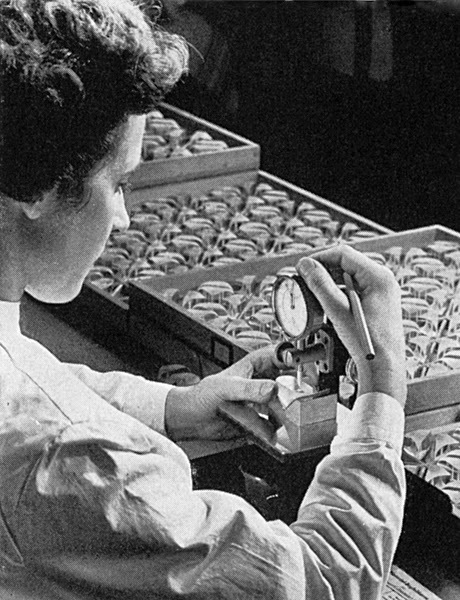 Testing thickness of lenses with a dial gauge. In between the individual working stages repeated progress checks are made to establish surface quality and maintenance of lens thickness and diameter. The quality of the surface is checked with a test plate (negative master). This is polished with extreme accuracy to the prescribed curvature, and for the purpose of the test is brought into contact with the lens tested. If the curvature of the lens is not identical with that of the test plate, interference bands, commonly known as Newton’s rings, make their appearance. Their number and regularity provide a reliable indication of the quality of the surface. Next follows testing of the surface for freedom from blemishes and the presence of bubbles, measurement of thickness, and of interfacial angle on the autocollimator. When one sees how many individual operations every lens, every prism, has to be put through, one can readily appreciate that it is a long, long way from glass block to finished objective or prism combination. There is an enormous range from the smallest to the biggest lens. 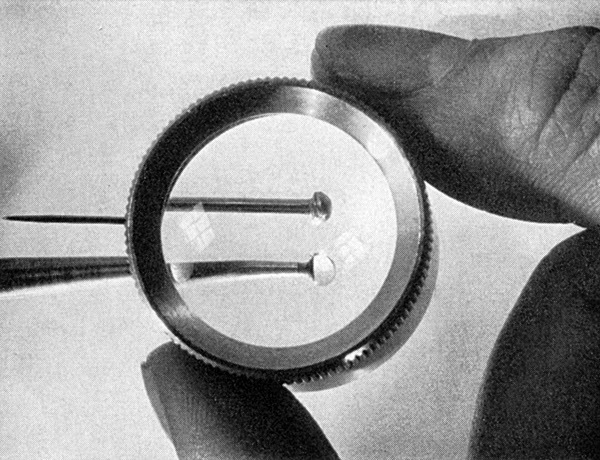 Lenses used in microscope objectives are scarcely larger than a pinhead, while the condenser lens of a large projector measures twenty inches in diameter. The polished lenses are then centered on the centering bench and then on the edging machine edged concentrically to the required diameter. One important operation still remaining is coating. In the coating department is installed high vacuum equipment with which certain substances are coated on to the glass surface to form a thin reflection preventing layer. This reduces reflections in the glass-air interface to a minimum, thereby considerably increasing the transmission, and therefore the effective speed of the lens. 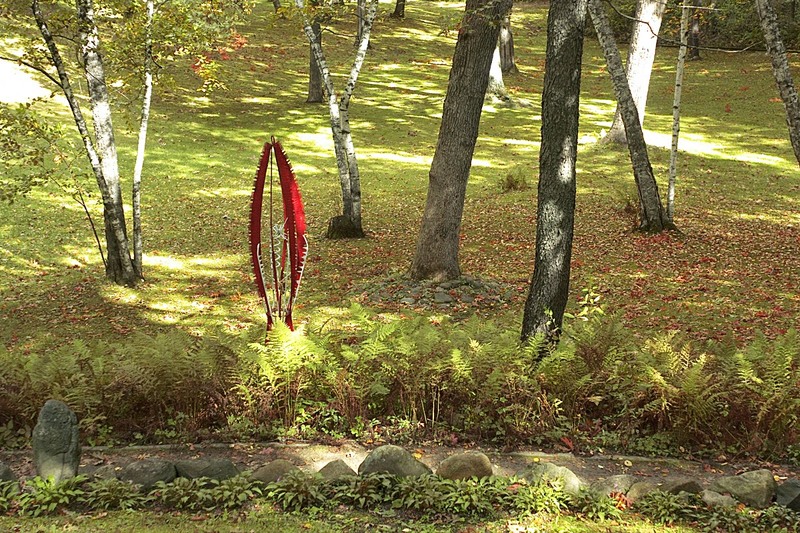 A still more important function of this layer, however, is its effect in minimizing scattered light due to surface reflections, which has the effect of reducing image contrast. Coated surfaces produce practically no scattered light, and the contrast and brilliance of the image is in consequence greatly improved. coated with slightly warmed canada balsam. One of the last processes the lens has to go through before mounting in its metal mount is seen in the cementing shop. Both flat-surfaced and spherical surfaced optical parts in some cases have to have their surfaces cemented together; hot cementing is done with canada balsam, cold cementing with Araldite. 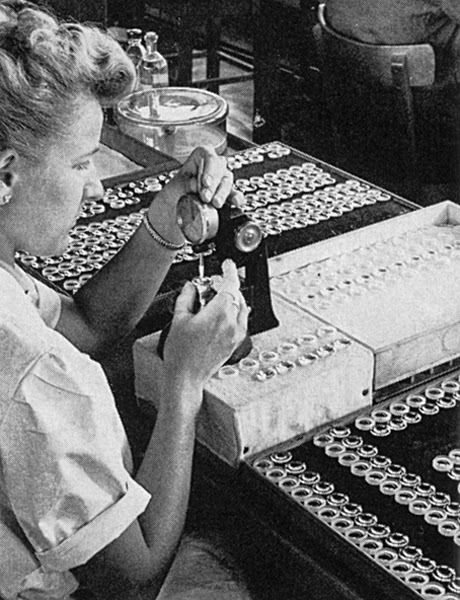 When the sets of individual lens elements have completed their passage through the optical workshops they pass through into the mounting shop. Here they are mounted up at their prescribed separations in accordance with the working drawings. 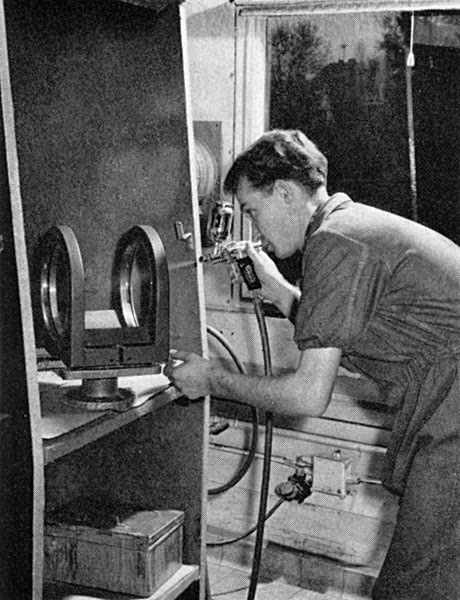 The ready prepared mounts are given their finishing cut, the lenses are inserted, and centered by the reflected image method: they are so adjusted that their centers and curvature all lie on one straight line, the optical axis of the lens. Diaphragm ring, distance scale, and depth-of-field ring complete the outer mount of the finished camera lens. As we are standing at the bench where the 50mm Noctilux lens is assembled, a visitor asks about the machines on which the aspherical lenses are made. In a moment we are plunged into an interesting conversation. We gather, however, that for security reasons it is impossible for our guide to show us these machines. The quantity production of aspherical lenses for use in the construction of extreme wide aperture lenses is, we are told, the most important advance that has been made in recent years. 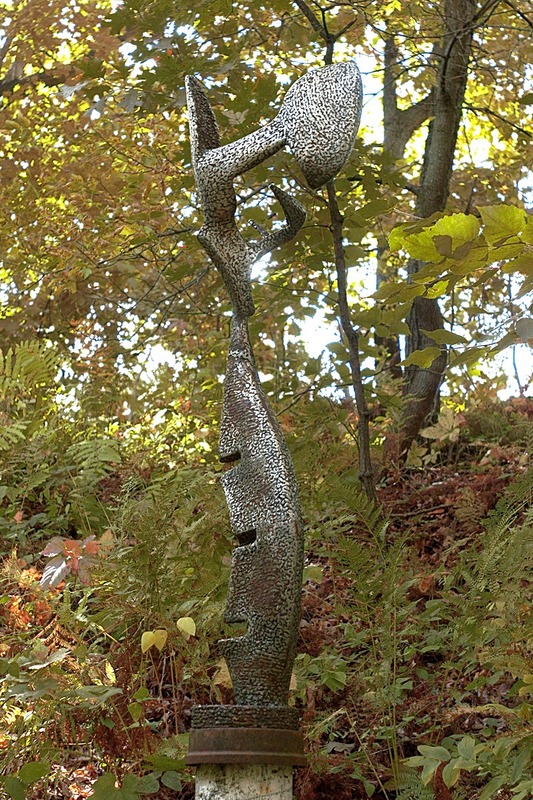 Metal working is a process with which we are all familiar. Almost everybody at some time has had an opportunity to look inside a fitting shop. Lathes, milling machines, lacquering shops, modern automatic machinery for dozens of different working processes – all these are to be seen in the reports of all manner of industrial plants brought to us daily since cinema and television have made audio-visual communication so easy. Nevertheless an actual conducted tour of a factory remains a special experience. Nothing can rival its immediacy. The sounds and odors, the atmosphere of the work bench, these things can only be fully appreciated by an actual visit to the scene. 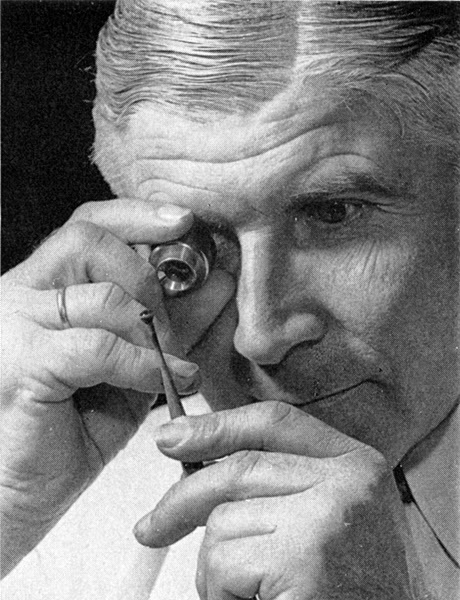 Similarly it is impossible to convey be mere description the quality of precision mechanism such as is embodied by long tradition in Leitz instruments. For this we must stand side by side with the precision mechanic, bringing, however, to the occasion a degree of sympathy and open mindedness. Our guide is well chosen: he is well versed in his subject, for he was for many years himself employed as production engineer. He leads us through labyrinths of countless departments so that in the end we really come to believe that we have completely got the hang of the factory set-up, and have in our mind’s eye a complete picture of the whole production scheme. In the material stores we see the raw materials of manufacture: steel, brass, bronze, aluminum, and plastics. In Store 1 are housed the castings. We examine the numerous housings and components; we learn how the machine produced casting is better from the finished point of view than the hand casting, for it is important in precision mechanical work that the rough casting should have as clean a surface as possible. In this department we see quite small castings, as well as castings measured in yards, as used for building the bulky measuring microscopes and big projectors. In the semi-products store are sheet metal, tuning, rods, and other profile material. We soon discover certain parallels between this tour and our visit to the optical workshops. 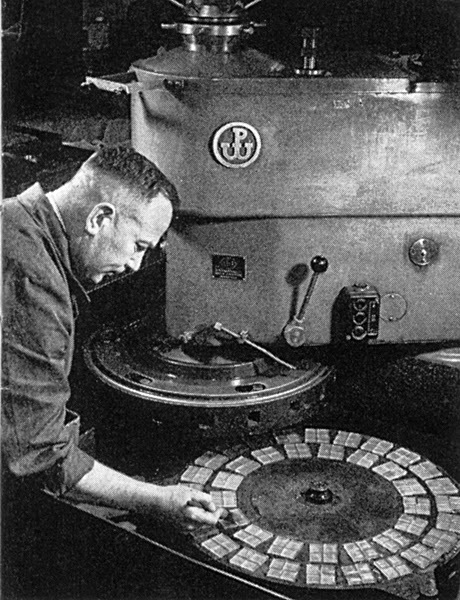 Here plate shearing takes the place of the slitting of the glass blocks. Glass rod becomes here metal profile, and molded glass blanks have their equivalent in metal. First we follow the casting through its successive operations. The first process, in the grinding shop, is to clean the casting inside out. Next it goes into a large furnace, in which it is annealed to remove any internal stress. We are told that this annealing process is repeated an number of times during the course of machining, because complete freedom from internal stress is essential to high precision. In many cases the precision mechanic also carries out inspection, and his work bench is accordingly equipped with the requisite instruments. 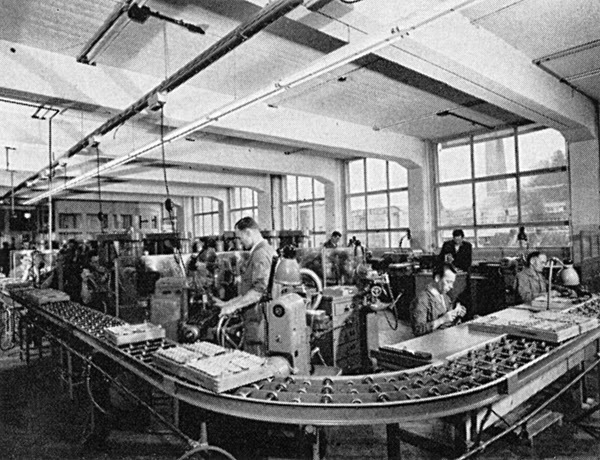 As in the optical bench there are many such measuring and checking instruments, and these are made in the Leitz factory. Right in the first stages of finishing we witness what our guide terms “the birth of the individual”, and we very quickly come to realize an important fact, namely that from now on the workpiece must be carefully handled as the individual that it is. Storage and transport are just as important as the work itself. In the next room it is literally a case of holding one’s breath – we are only permitted because we are a small group. 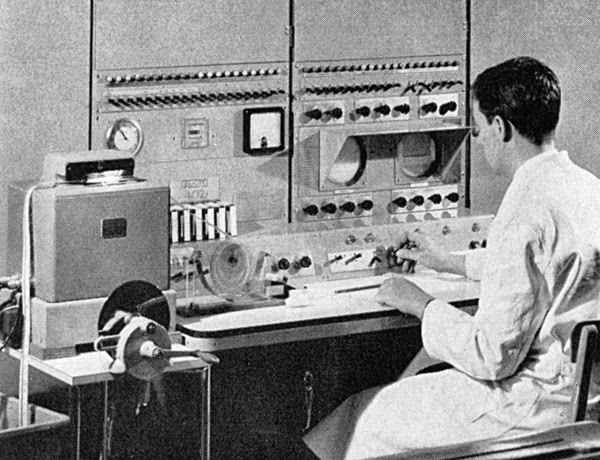 Any surface contamination, even the moisture of one’s breath, would lead to malfunctioning of this delicate measuring equipment, with consequent expensive reworking. One of our group was a very devoted photographer. His remark was: “I quite see what he means; if anyone were to bend over my unglazed transparencies I would instinctively my breath for him”. 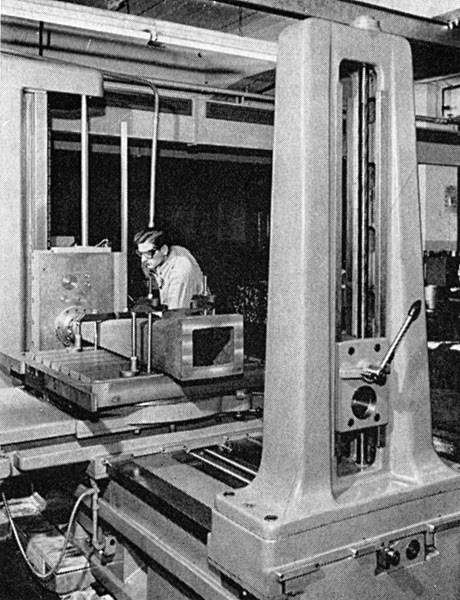 60 ton hydraulic press in the stamping shop. Before proceeding to the heavy component section, we take a look in the turning section. We have already referred to semiproducts, and here can see for instance how in a semi-automatic lathe a steel rod in a matter of seconds is first cut off, and the cut-off section is from the other side provided with a variety of profiles and screw threads. One other thing we notice in the turning section: a small chart such as is to be seen hanging in every other department. At first glance it seems to contain only a few numerical data. Nevertheless behind them is a carefully worked out system of production control. 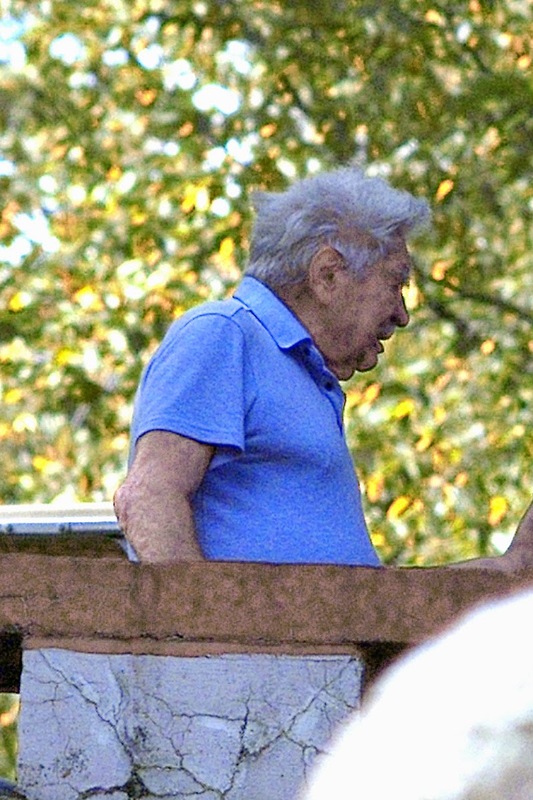 We are told that years ago Leitz adopted a policy of leaving virtually nothing to chance. It is not enough to buy good materials, process them accurately, work exactly to plan. 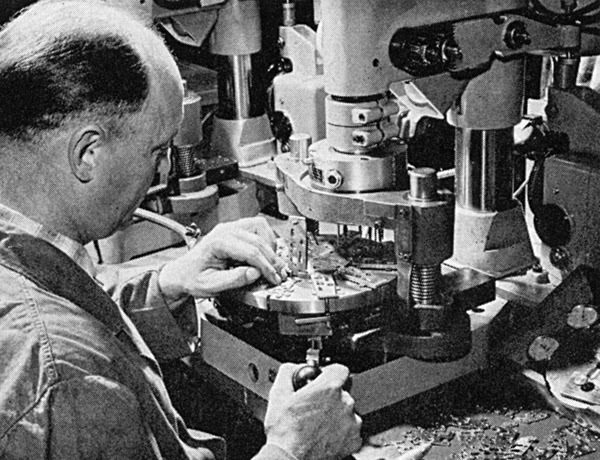 Milling operation on a Profile Projector. 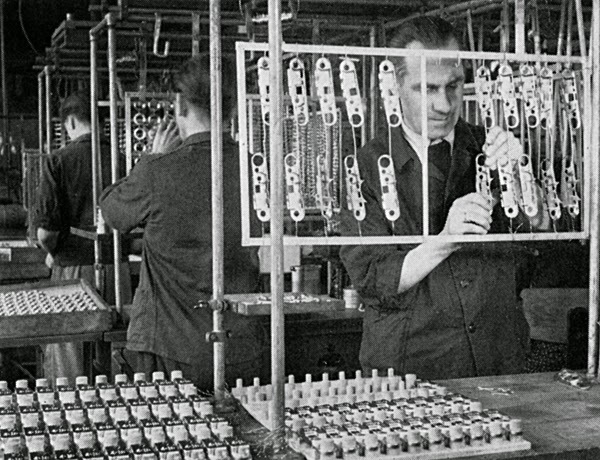 Production control picks up every error, records it on punched cards, assesses precisely its significance, and can then quickly and effectively eliminate the cause. And not only does it thus deal with errors, it also assesses efficiency. At the end of the month it pays out in hard cash if a team has exceeded its “qualitative” norm. A few steps further we encounter a fully automatic machine and take a look at its interior. The programming strip reminds the older among us of the earlier electric pianos. This not surprisingly leads us into a philosophic discussion. Fro everyone with imagination must realize the enormous extent an diversity of the technical progress involved. A fully automatic machine of this kind not only performs its various tasks automatically, it does so with high precision. On the other hand one of the more striking convictions we came away with from this visit was that man of the future was not destined to degradation to the status of machine minder. What a miserable existence such a robot must lead without its master. He it is that must be responsible for keeping up to date; he works out the programs without which not a wheel can turn. 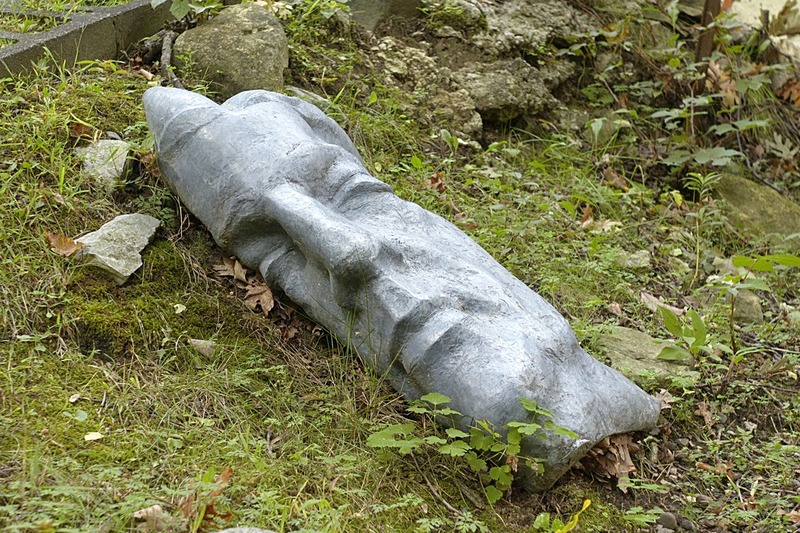 Man must remain indispensable, not only intellectually, but also by virtue of his manual skills. To this, the precision mechanic is an eloquent witness. Just as we had got on the subject of “electronic brain” in general, our guide tells us that we happen to be quite close to a computer. So his suggestion that we should have a look at it is enthusiastically received. Our guide explains that we are not going to the date processing department, but to see how computers are used by those responsible for the design of Leitz lenses and optical systems. 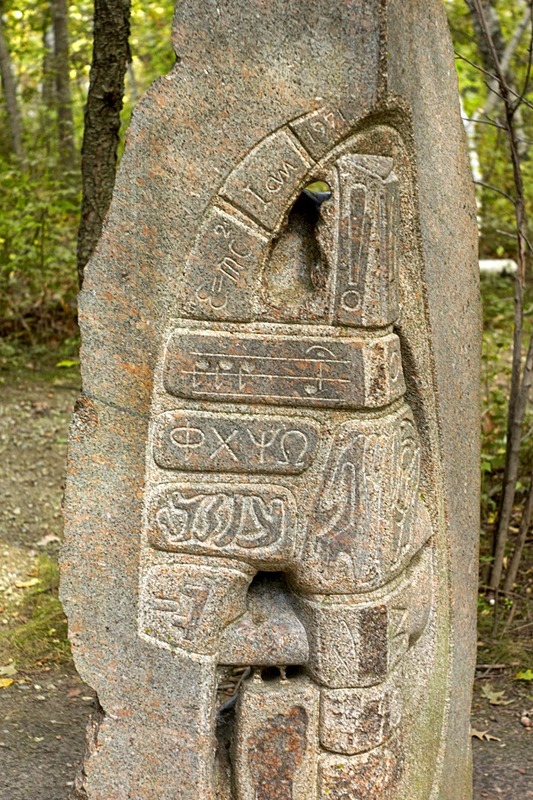 Calculation which formerly not only used to occupy weeks, but which also had to be restricted to within a much less comprehensive scope, today are carried out by computer in minutes. Thus quickly and precisely – for the machine operates just as efficiently after eight hours’ work as at the beginning of the day – it is possible to verify whether one I on the right track or whether and where corrections will be necessary. 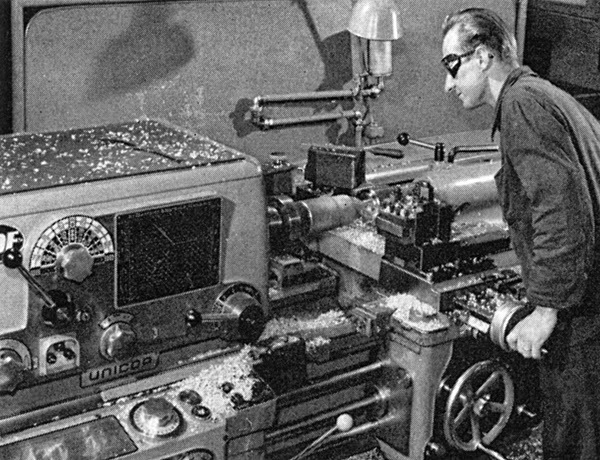 Without the use of computers the results of the research into high performance new optical glasses could not have been exploited to maximum advantage. We are permitted to look inside the machine. The technician in charge explained to us what are the important things to bear in mind in operating and servicing. We leave the room convinced that a modern lens, and its continual improvement, is the result of glass research and optical calculations. A few minutes later we are on our way again “from raw material to precision instrument”. In the large component finishing department we see once again various housing which we have already met with on numerous occasions at various stages: the support for the large projector, the modern “angular” housing for the microscope, the classical curved stand. We ask about projectors, about the Leica and Leicaflex, and are told that this work is carries out in other shops and other factories. 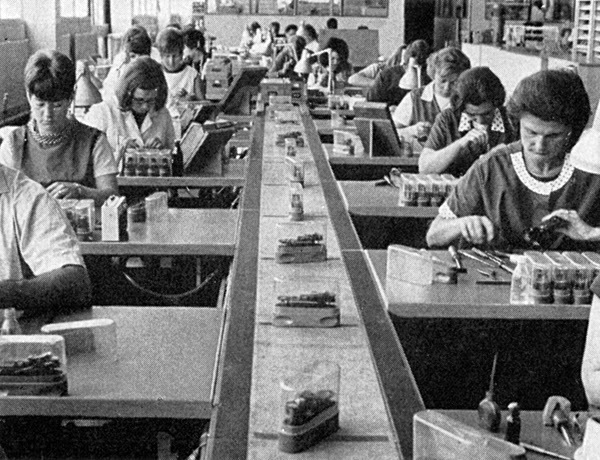 At the railway station factory is the assembly line for the Pradovit Color and Pradolux miniature slide projectors. In the new Weilburg factory we are shown the finishing of the aluminum pressure cast body of the Leicaflex: modern production lines, multiple spindle drills with which some 65 holes can be drilled at a single operation. The next basic process after the large component finishing process is surface treatment. The moment we enter we are struck by a typical odor; this is where electroplating, anodizing, lacquering are done. The components or housings to be treated are suspended on frames which are then immersed in the chemical solutions’ contained in large tanks. Immersion, removal, and further transport are all preformed automatically. As in the production, everything here has become a matter of rationalization. The flow pattern must be as smooth as possible. That is why visitors to the factory present something of a problem. The floor is always moistened again immediately, for dust is the greatest enemy. Not everything is automatic; there is also hand work, individual work, according to the nature of the operation. This is, after all, not a car factory, but a section and individual working. Here hundreds, thousands of different components are manufactured. Consequently, notwithstanding all the rationalization and simplification of manufacturing processes it is almost impossible to carry out all the operations of manufacture from raw material to final assembly on a conveyor belt. “unfortunately” says one – “fortunately” another. Assembly of the camera shutter. Mounting the self-timer in the Leica. Optical set-up of the Leicaflex lenses is being checked. drilling and screw cutting machines. bright line view and rangefinder. 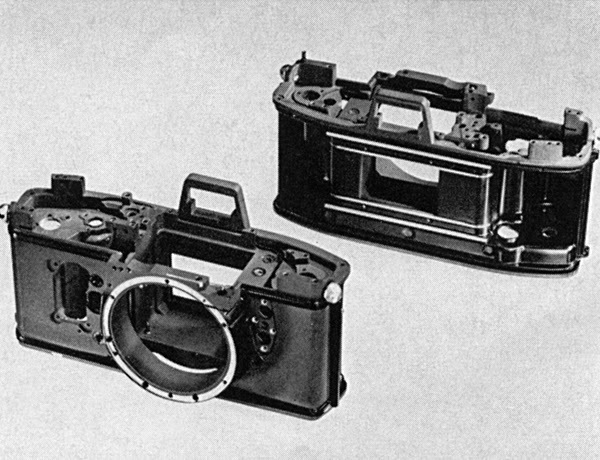 Dust-free packing of the Leica. perfect parallelism of the lens and film plane. the flash synchronization of the Leicaflex. A chain is only as strong as its weakest link. In assembly, therefore, quality and precision are of the utmost importance. 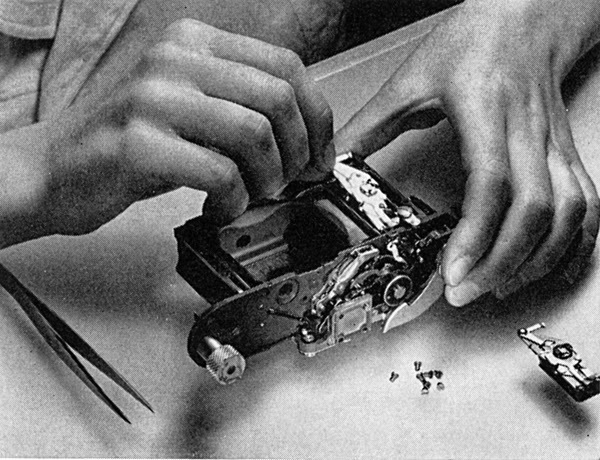 For this is where optical and mechanical parts are assembled so as to become one unit. The optical axis must not be distorted. The assembly process is not just a matter of adding component to component on the unit construction principle; frequently it is possible by setting on manufacturing tolerance against another, and by making final adjustments in assembly, so to improve performance that plus and minus errors are mutually balanced to zero. The Optical Master Dividing Head – to take once more an instrument which is manufactured to the highest standards of accuracy with corresponding precision of performance – is finally reground ready mounted in the position in which it will later be operated. Incidentally this Optical Master Dividing Head has played an important part in the development of space travel. It is used to orient the control platform. Assembly might be basically divided into three stages: subgroups – groups – final assembly. How many parts are assembled at any one time is of course very different with different instruments. Routine production controls particularly attracted our attention. As photographers we are often more intrigued by portraits of these specialists than with what they are doing. Every now and again we see a team working in a “glass case”. Here there must be neither dust not too much or too little humidity, the temperature must be rigidly controlled and the room can only be entered or left through an air lock. 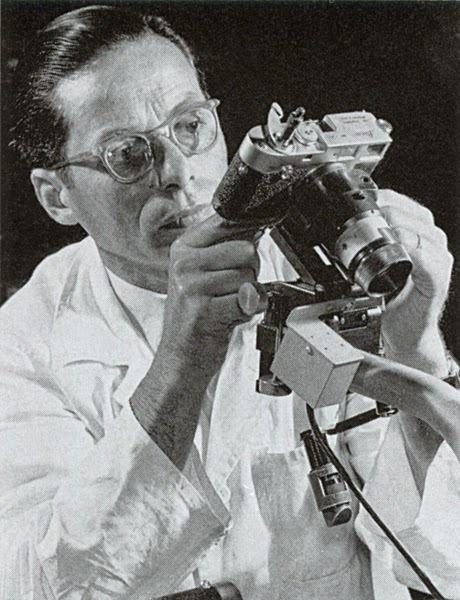 Portrait of a microscope objective lens examiner. In photographic assembly we once again gather around a large glass enclosure. Here is to be seen a complete Leica dismantled into its components: a graphic recapitulation of our tour and a convincing documentary display. 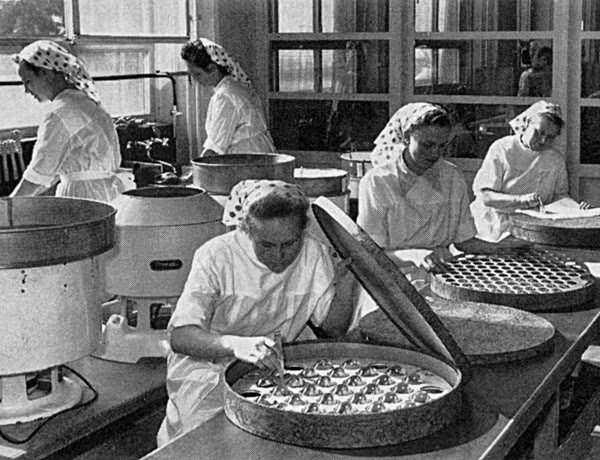 We discuss the problems of distribution of production and manufacturing preparations; how extensive is the necessary organization to ensure that all the components required reach the assembly point in the right numbers and at the right times so that, for example, in accordance with the production schedule Batch 284 can be assembled in the 27th week and is for dispatch according to contract in the 34th week. 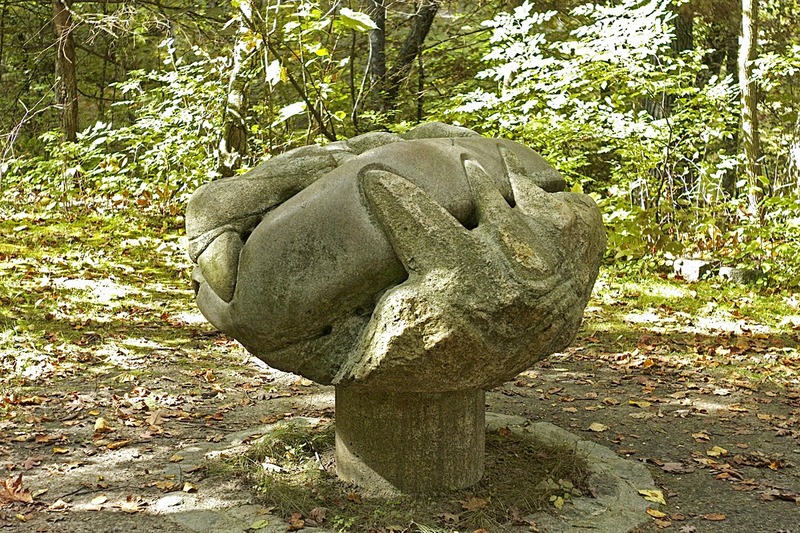 It is appropriate here to take a look back at what things were like a hundred years ago, and what slender resources Ernst Leitz had at his disposal when he took over the small factory in 1869. 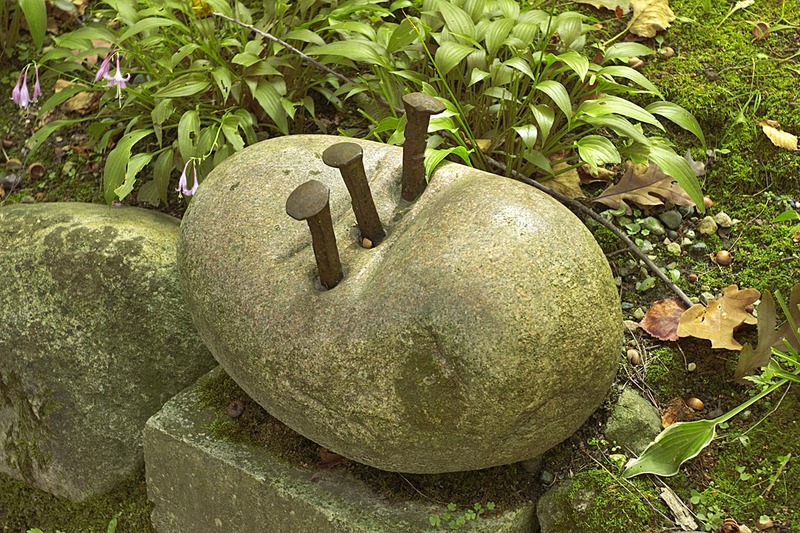 “Four lathes, two of them iron, the other two wood. 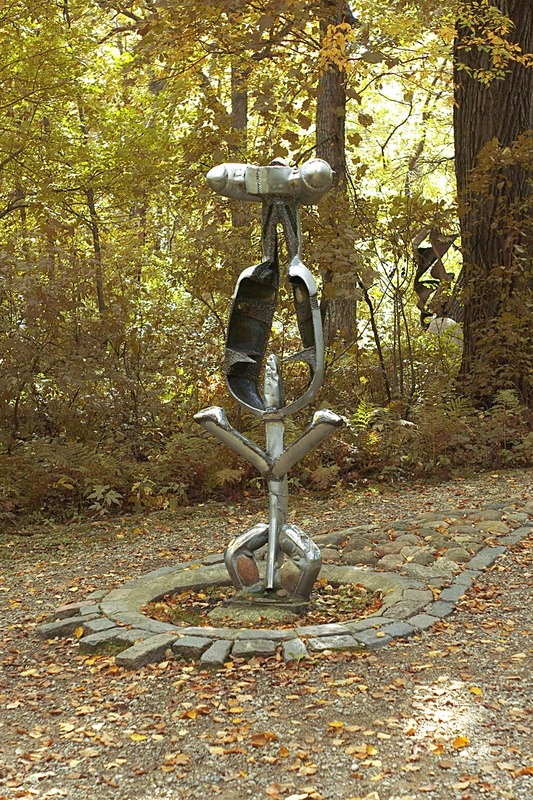 Four bench vices. Four racks for files and chucks. Seven oil lamps, five hammers, two screw calipers, two dies, two hand drills with drill bows, pliers, files, saws, one small and one large bottle of varnish. Today the factory turns out more than 5000 salable articles. Today it is not sufficient to look through the microscope: quantitative measurements are demanded. 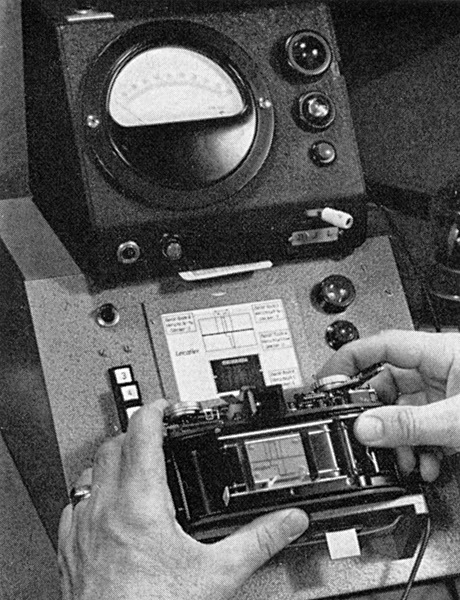 To every “scope”, or observation instrument, there is a corresponding “meter”. But even measurement often does not suffice; permanent records are wanted, so the “graph” has to be added. Deviations have to be corrected, and inevitably we reach the point where the measuring instrument itself makes the correction. 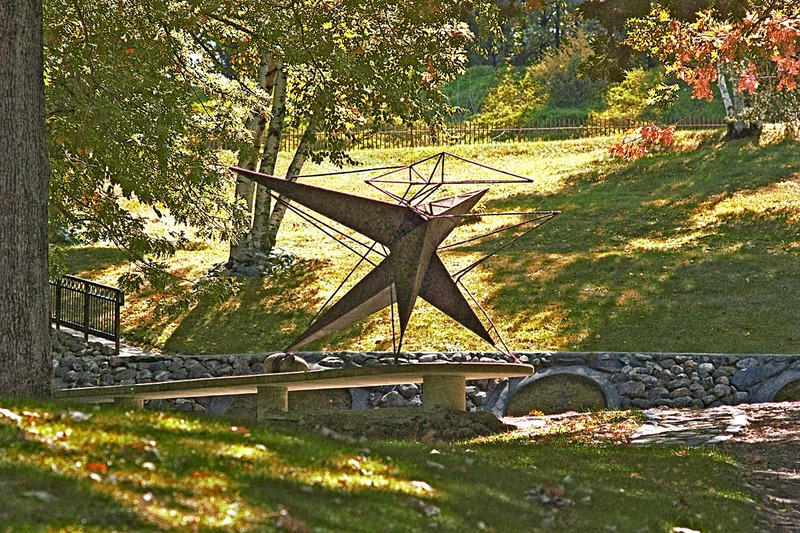 This is born the “star” which maintains conditions constant. Finally the “mat” brings in automation to raise the instrument to its highest development plane. Such is the long but systematic path from the first great advance in design, the orthoscopic eyepiece, to the fully automatic photomicrographic camera, the Orthomat. 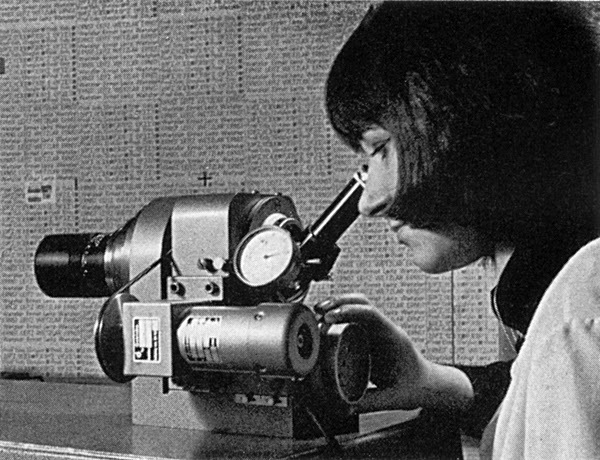 For the manufacture of high performance microscopes, instruments of high precision were needed for measurement and materials testing. They likewise had to be designed and manufactured. 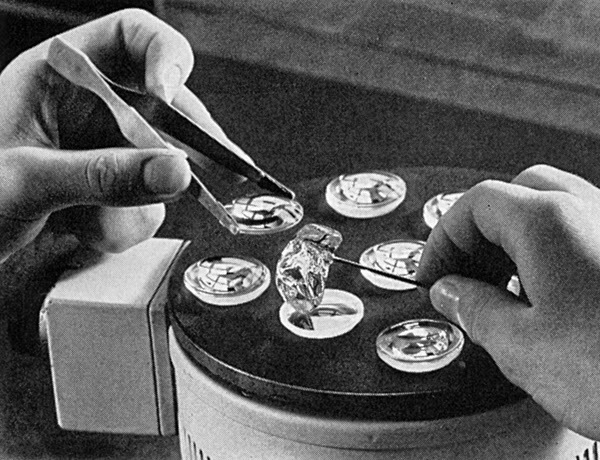 The materials used had to be tested for quality before they could be used, and from the outset the opinion was held that quality control was a practical proposition. So Leitz became at the same time manufacturer, buyer, and customer. Their customers throughout the world are beyond count. 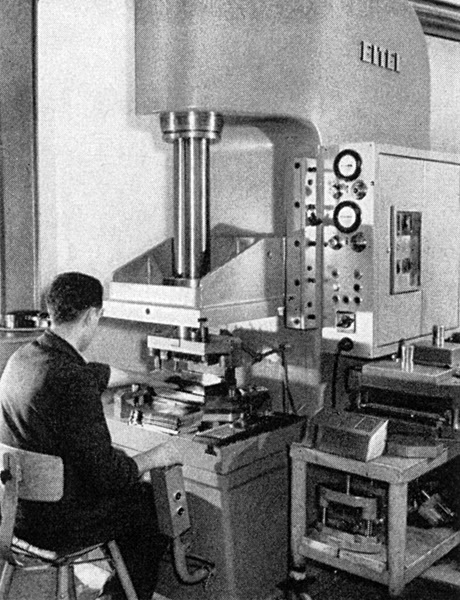 Leitz not only manufacture their products: they also test them with special equipment largely developed by themselves. This constitutes a double, a triple guarantee of highest precision and quality. This applies to every department of manufacture: microscopy, metallography, photography, projection, measuring equipment, etc. 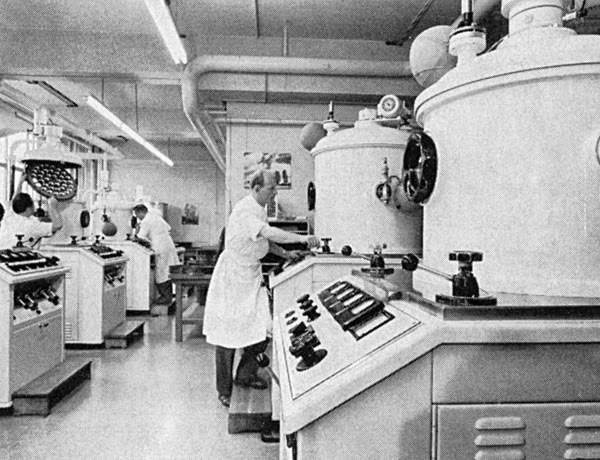 Special laboratories with equipment for research and testing are at the disposal of all branches of the factory. A great responsibility falls on the optical laboratory for the testing of lenses. This is where the optical data of lenses are determined and their entire performance investigated. Electric and electronic constructional elements and equipment are tested in the electrical testing room and photographic equipment in the testing laboratory. 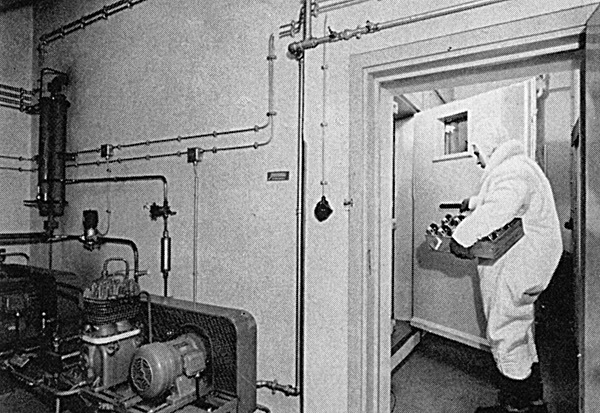 Among the facilities available to the testing department are large refrigerated testing rooms down to -60 ᵒC, accessible to inspection, refrigerators down to -80 ᵒC, air conditioned containers for the maintenance of any desired climate conditions, fog, spraying, and sprinkling devices, jolting machines, and vibration, shock, and pressure testing machines. And so this widely extended, skillfully coordinated testing organization provides the sound basis for the Leitz guarantee of consistent quality and reliability of all its products. 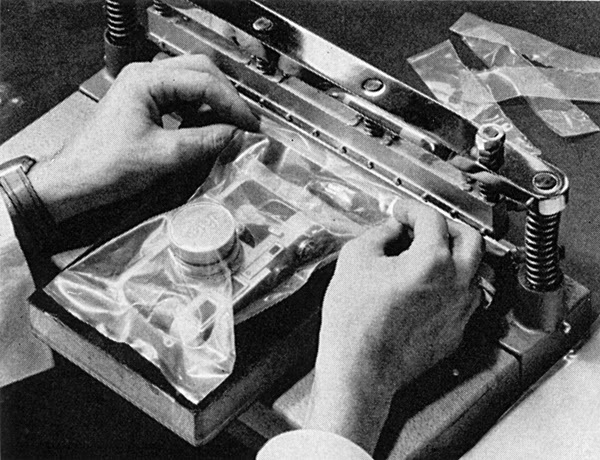 It is characteristic of Leitz production that besides a great deal of very successful commercial apparatus, other products have been developed the idealistic value of which counts more than material success. This adequate motive for the development of trichinoscopes, tyndalloscopes (dust counters for mining, etc. ), and other scientific instruments existed in this spirit of awareness to have resulted in valuable contributions to the welfare and health of millions and fundamental advances in scientific research. 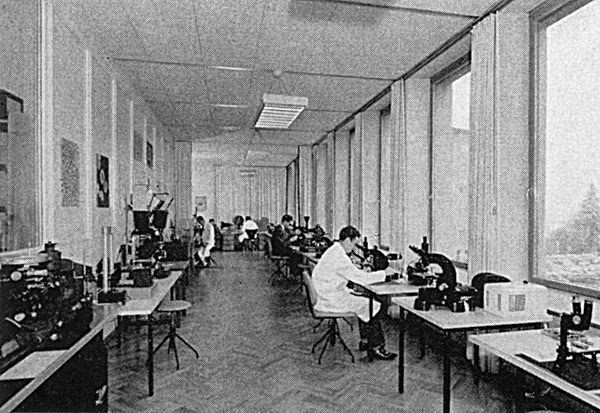 Part of the microscope laboratory. 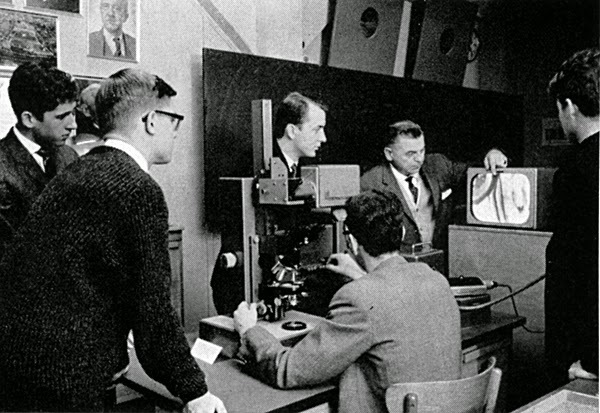 Students taking part in a course of microscopy at the Leitz Works. 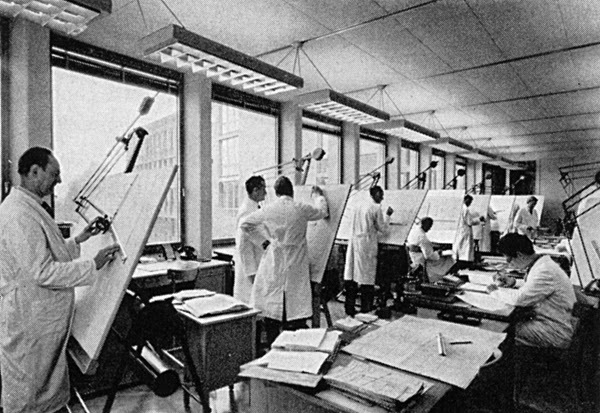 Part of the construction design section at the Leitz works. 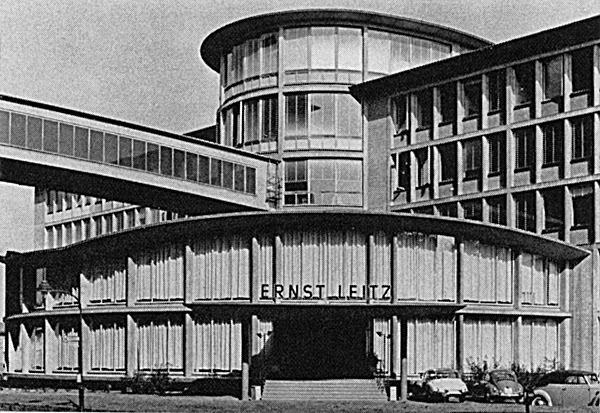 Ernst Leitz GmbH in Wetzlar. Please note: This report was written prior to Ernst Leitz GmbH splitting up into the four independent companies that bear the Leica name today, Leica Camera AG, Leica Microsystems, Leica Biosystems, and Leica Geosystems. The philosophy of utmost quality and performance continues to be a very important aspect of all four companies. WHAT IS HAPPENING WITH THE LEICA SOLMS FACILITY?